It was in only the third minute when Maddison and Kelechi Iheanacho, two players to have arrived at Leicester since Ranieri's departure, combined for their first sight on goal. When the midfielder's through-ball sent Ihenacho through on Sergio Rico he had a fine chance to give them the lead, but where the injured Jamie Vardy - who he had replaced - would likely have finished he instead shot straight at the goalkeeper, who comfortably saved. Tom Cairney's absence from Fulham's starting XI also felt significant but the way in which the hosts responded by also creating chances ultimately justified his selection as a substitute. Aleksandar Mitrovic was denied from the first of several that came before half-time when Kasper Schmeichel saved his close-range shot towards the bottom left corner, and then defender-turned-midfielder Calum Chambers also became a threat. From a free-kick from midfield Jean-Michael Seri crossed towards Denis Odoi, and when his header fell kindly to Chambers who struck powerfully and accurately at goal, Schmeichel again responded, this time producing a superb reaction save. Two of Ranieri's title winners then had their turn, first when Marc Albrighton shot over the crossbar and then when Wes Morgan forced a fine diving save from Rico, after Maddison had played a short corner to Albrighton and the winger had crossed towards the back post. A competitive and open affair appeared increasingly likely to imminently witness its opening goal, and so it proved when in the 42nd minute Kamara gave Fulham the lead. Luciano Vietto had also gone close when, with Leicester struggling to deal with a long ball, Mitrovic flicked on to Kamara, who eased ahead of Caglar Soyuncu into the area before cutting inside the defender onto his right foot and finishing between Schmeichel's feet. Both teams continued to create chances during the second half, and Cairney went close for Fulham before, in the 74th minute, two other substitutes combined to bring Leicester level. 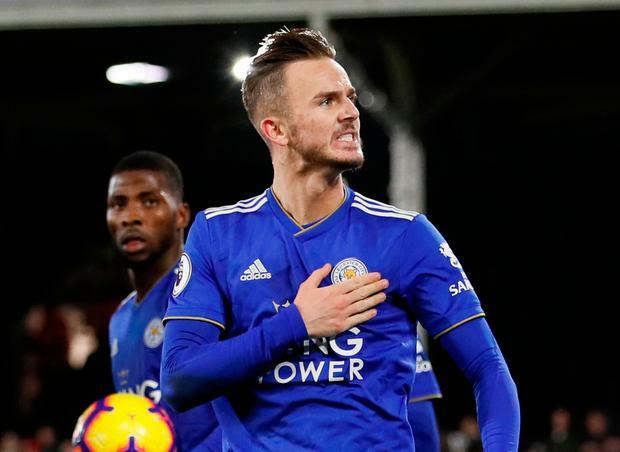 Shinji Okazaki and Demarai Gray exchanged passes down the right wing to split the hosts' defence before the former then laid back, inside the area, in front of Maddison, who calmly strolled onto the loose ball to curl first time towards the bottom left corner. After Cairney again tested Schmeichel, Gray and Maddison forced a double save from Rico in stoppage time, which concluded with Odoi scooping over with time and space directly in front of goal.